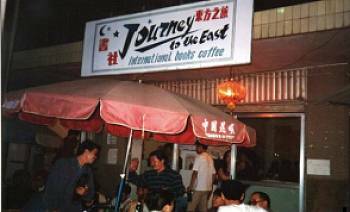 Journey to the East where you'll find the best coffee in Kunming, not to mention the largest selection of used books - English and more - anywhere in China - so we're told - plus information, conversation and a great view of the world as it passes by our windows. It's been three years since I left China. Journey to the East is now in the hands of inlaws and I no longer exercise any responsibility or control over it. Nevertheless I'll always consider it one of my major accomplishments, and it's still a must stop for the intrepid Yunnan traveler. Journey to the East is located on a quiet street in Kunming's University district and well worth the trip from downtown.